Next, invite parents and kids to breathe in deeply through their noses to “smell” a flower, then blow out slowly through their mouths as if blowing the seeds off a dandelion. 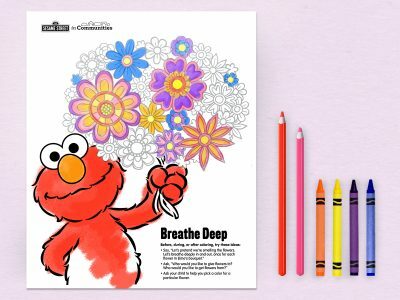 Use this adult-child coloring sheet as an opportunity for relaxation, collaboration, praise, bonding, and conversation. Adults and kids can sit side by side in a quiet space with a surface. Kids color the Muppets, adults color the background (it’s okay to sit without talking, and there’s no right or wrong way to color!). Suggest that parents display the completed page at home in a place visible to everyone, to remember the time they spent together…and to breathe deep.